If you're looking for the ultimate party tent, then look no further. The Premier Ultimate Party Tent from Ohenry is a 100' x 100' masterpiece of tent design. Whether it's for event hosting, temporary storage, outdoor revivals, and even the tent rental business, this amazing canopy can handle it all. It's designed to withstand 70 mph winds in optimal conditions, and includes a handy installation video. 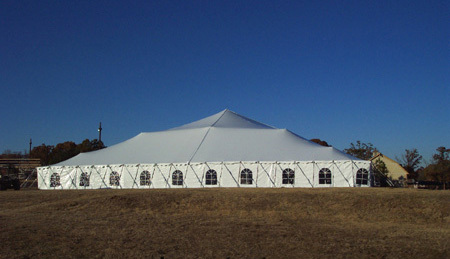 A 1 year manufacturer's warranty is included with the 100' x 100' Ultimate Party Tent. How many people can fit inside this tent? Depending on your configuration (theater seating, cocktail tables, rectangular tables, etc. ), a 100 x 100 tent could fit about 1000-2000 people. Thank you. Do you sell used tents in 100x100 or any other size? I apologize but we do not have any used tents.